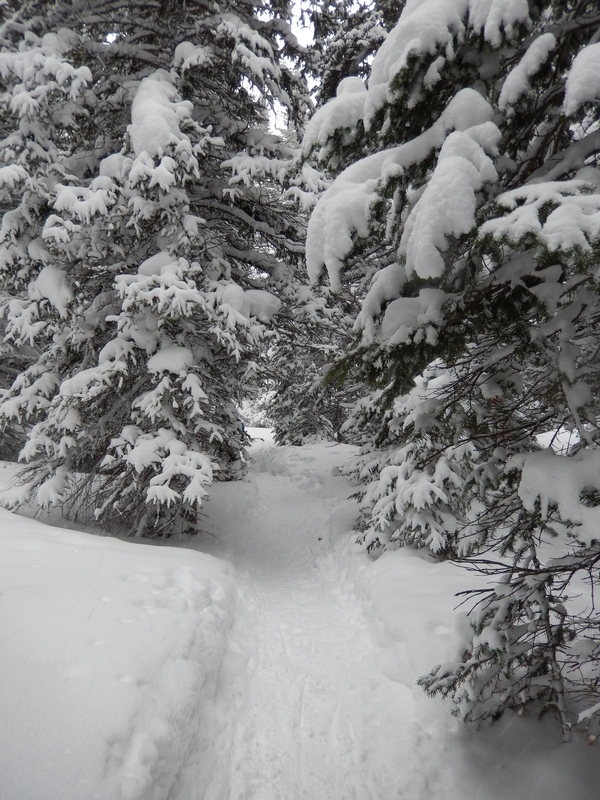 I know I usually start with all the details of a new hike but this snowshoe was not what I expected, instead it was everything I could have hoped for and more. 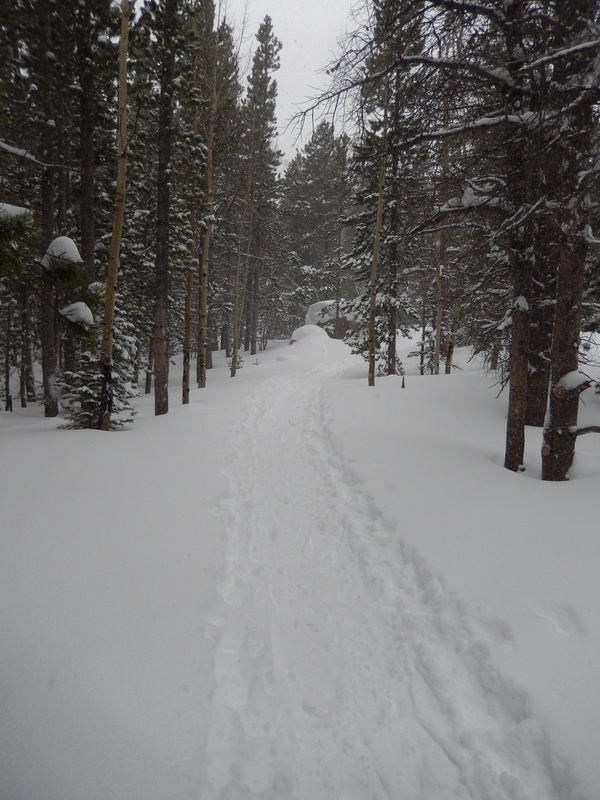 Because of that I have no hard facts and no path to tell you to follow but I can tell you I am totally in love with snow shoeing and even purchased some snowshoes this week….just waiting for them to arrive. On the way up we were hardly on a path… we broke our own trail and eventually made our way up to Mills Lake in Glacier Gorge. The weather was terrible, heavy snow and the wind just got worse the higher up we climbed but I still had an amazing time! 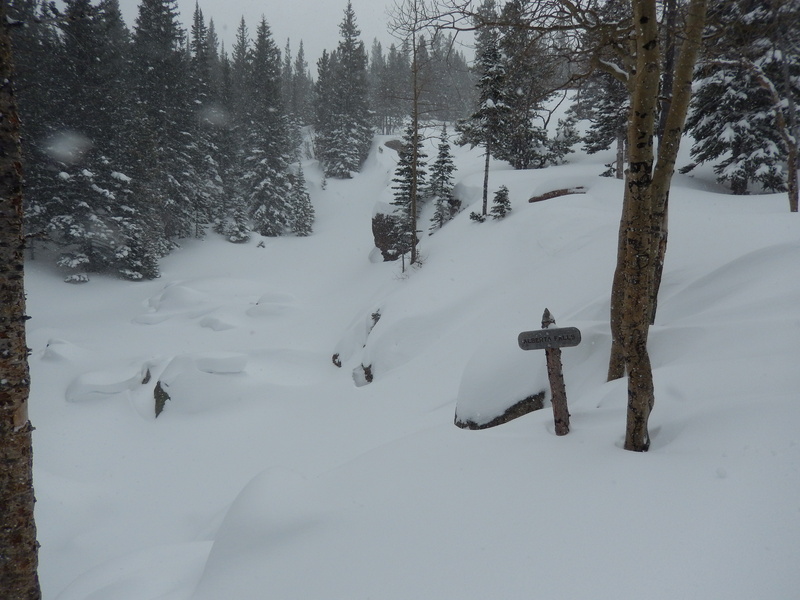 The best part about the snowshoe was the guides and their comfort with the area, with that knowledge they said we could pretty much explore where ever we wanted and let me tell you it got pretty creative. If I was honest with myself, I was ok with this approach because the weather was so bad that there were no views to see anyway, but on a nice day this might have been a little bit of a bummer as I have read that this trail has amazing views! 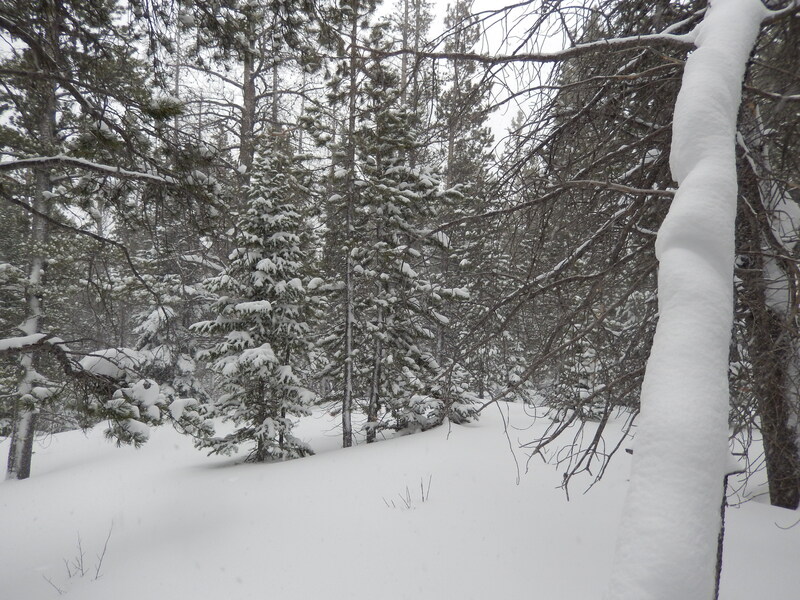 I think originally the plan had been to sort of follow the summer trail to Mills Lake, we wove in and out of huge drifts of snow and along a creek bed until we eventually came to the Alberta Falls, which were of course covered in lots of snow. Once we got past the falls we crossed over the creek a few times until one of our group broke through the ice and soaked her foot. This wouldn’t have been a big deal except she had on gym shoes…. yep she wore gym shoes to snowshoe in even after the email and phone call the day before said how important waterproof boots were. To make it worse, for whatever reason she insisted on breaking trail… in gym shoes and the guides were not going to fight with her so they gave general directions and told her to just have fun with it. Needless to say after they got her out of the creek, into dry socks and caught back up with the rest of us, we had gone pretty far afield of the summer route. Again not a problem, as they just took the lead and got us back on track, we did everything you could hope to do in snowshoes during this correction path and it was so fun. 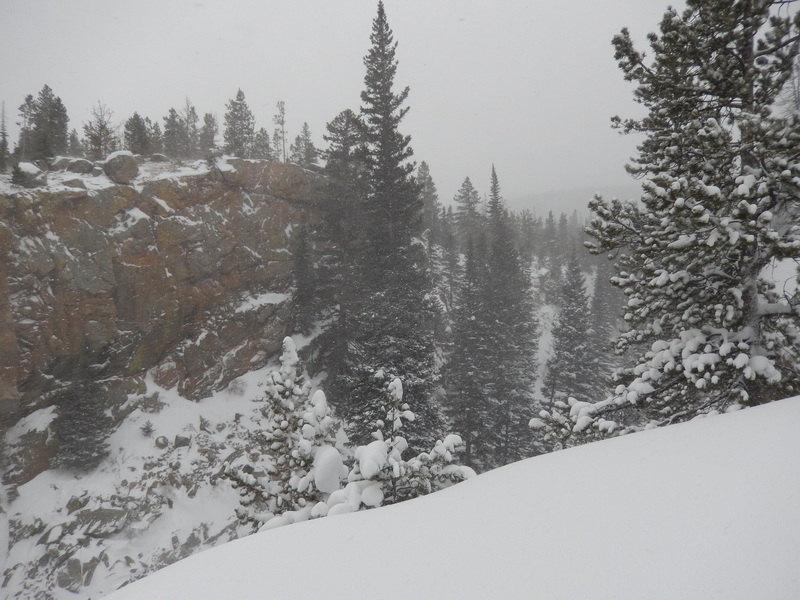 We climbed up steep inclines, through thick trees and around massive boulders, I fell a lot but it wasn’t a big deal because it was in like 6 feet of snow so no injuries! As we got closer to the lake, the wind and snow really picked up intensity it was pretty much like walking in a blizzard. One of the guides knew of a great spot for the fondue across the lake… like walking across it…. so we snowshoed across Mills lake and had a lovely fondue out of the wind while watching it whip around the lake with a crazy amount of snow. Did I mention it wasn’t supposed to really snow at all on Saturday, maybe an inch at most? 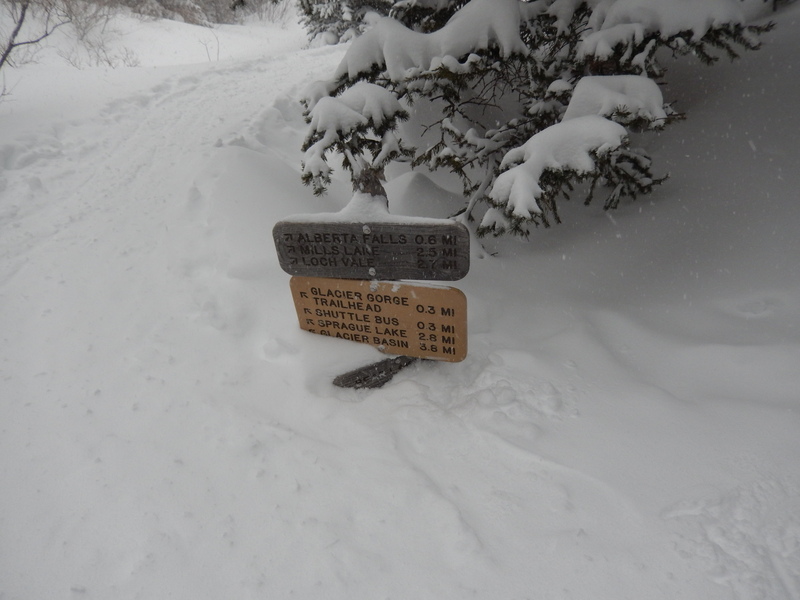 On Monday I read the park itself got around 35 inches of snow, most of that was on Saturday. These guides were quick in getting the fondue together, it was simple but delicious and ready in like 5 minutes. 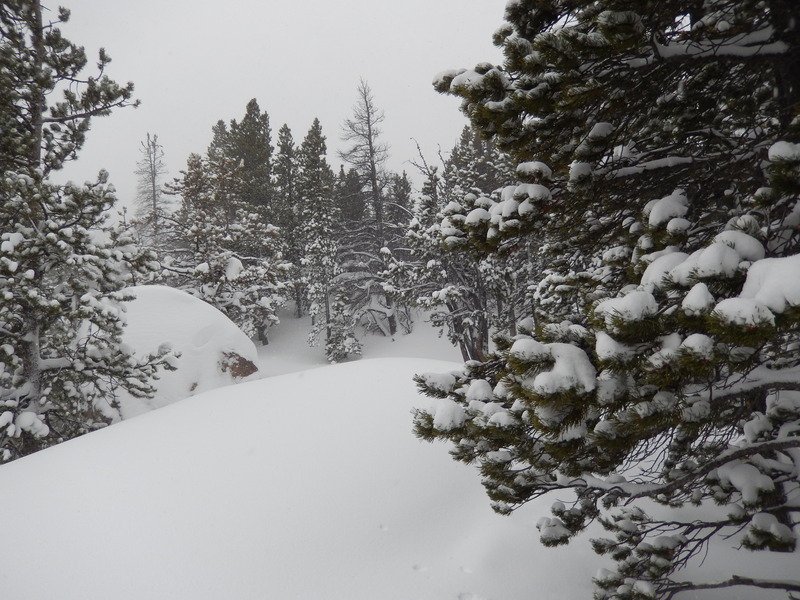 We had been snowshoeing for 4 hours before the fondue and everyone was spent but exhilarated. When we had all had our fill, they asked us if we wanted to go straight down or take the longer way down. If it had been different weather I know I would have gone longer but it was wicked windy and the snow was very heavy at this point, as a group we agreed fastest way down was best. We took the winter route back down which gave me great comfort in terms of our first solo snowshoes that we certainly have in our future. How awesome is it that the guides were completely ready to take us out for as long as we wanted? An hour later we were back at our cars and heading home. I will tell you the weather could have made this a miserable experience but the guides were so great, laid back and engaging, it kept everyone’s attitude happy and fun. Here are the details behind the trip, this was a groupon that I got for a day long guided snowshoe with fondue and cider lunch. It included the snowshoes and poles all for $98, the additional cost was tipping the guides and the $20 fee daily car fee to get into Rocky Mountain National Park (OR you can pay $40 for annual pass to the park, I bought the pass,) I can see us spending a lot of time in Rocky Mountain National Park this year so it was a good investment! 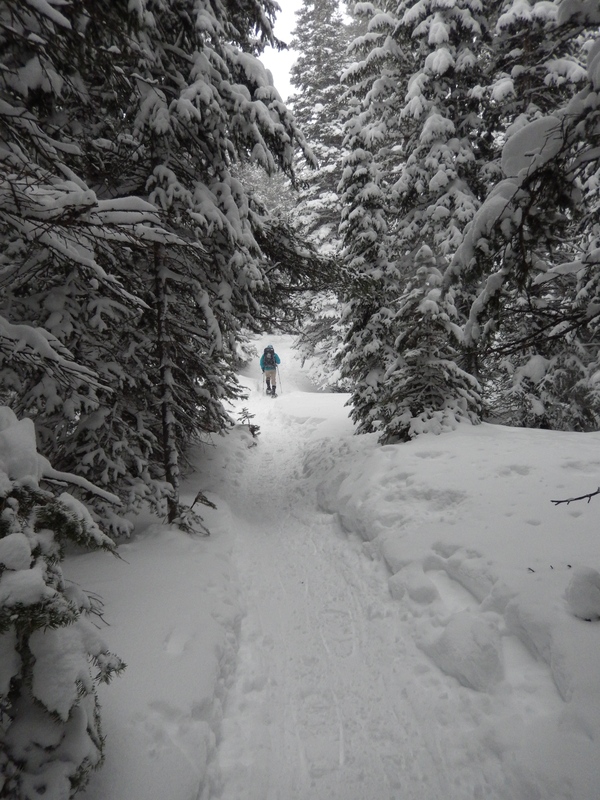 Normally the Day long guided snowshoe with fondue and cider is $399 per person. It was run through Apex Ex , they do all sorts of Mountain activities and adventures in Rocky Mountain National Park. I was very leery of how it may turn out as I always am a little fearful of groupons, but I cannot convey strongly enough how truly awesome our guides were. I don’t know how many of you have a chance to take advantage of something like this but if you are here in Colorado and want to do it , request Tyler and Mike they made it a perfect trip. 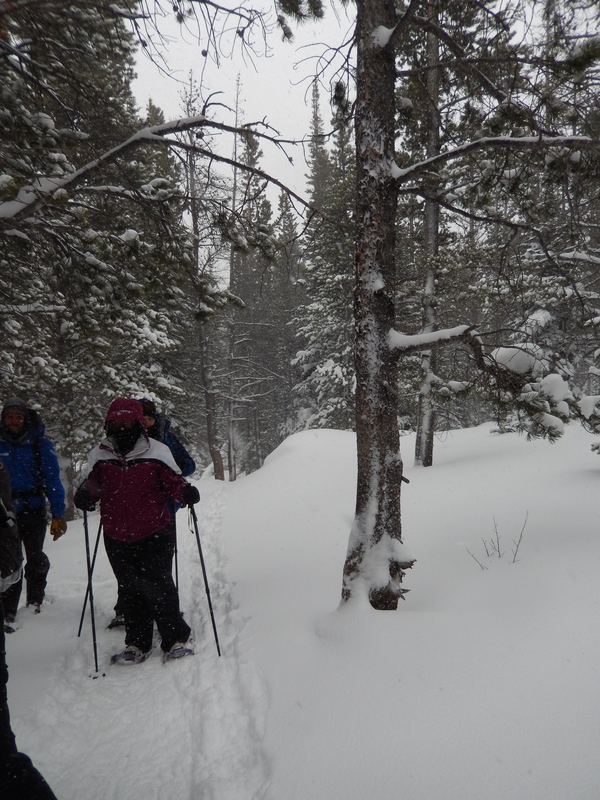 I cannot wait until our next snowshoe adventure, I wish those snowshoes would show up quick! ← Weigh in Day 2/7/14 -1LB, 53.8 LBS down – 36.2 left to go. This looks like so much fun, and the woods with all the snow is gorgeous! It was great fun!!! And it was beautiful all along our path. Snow certainly creates its own sort of beauty! Sure better than what I did Saturday, sitting around, looking at the lousy weather and feeling sorry for myself. Just goes to show, when you’re feeling down, get outside, regardless of the weather. Good job! I hear ya! I can no longer go a weekend without getting at least one hike in, otherwise it just ruins my attitude for the whole week! I now have gear to get out in any weather to keep me sane…. I hope you make it out this week! You have to try it Nancy! It was so much fun I cannot wait for my new snowshoes to show up! I already know which path I want to do first! Now that is some serious snow! What was it like walking with snow shoes?Easy to get used to? I kicked myself a lot which led to me falling… more than I want to admit, but other than widening my stance it wasn’t that much different from hiking without them. Outside being able to stay on top of the 6-8 feet of snow we were on, of course. It just opened up a whole new world of possibilities for us in the winter and spring! Ugh! You guys have been join through a serious drought! !!! I hope you get lots of moisture soon, in whatever form!!! You will!!! We loved it!!! Thanks for checking out the post! So glad you had a great time! The snow in RMNP has been crazy lately! Snow all over the mountains has been crazy!!! But I can’t complain it means a great wildflower season for hiking! Do you remember that forecast of minimal snowfall came from? My weather app and the guides. They probably were…. in the past I have had pretty good luck trying a town close but it was a wonderful error regardless! I couldn’t have had a better experience! I was in the park and in that area on the same day as you. We might have passed each other. 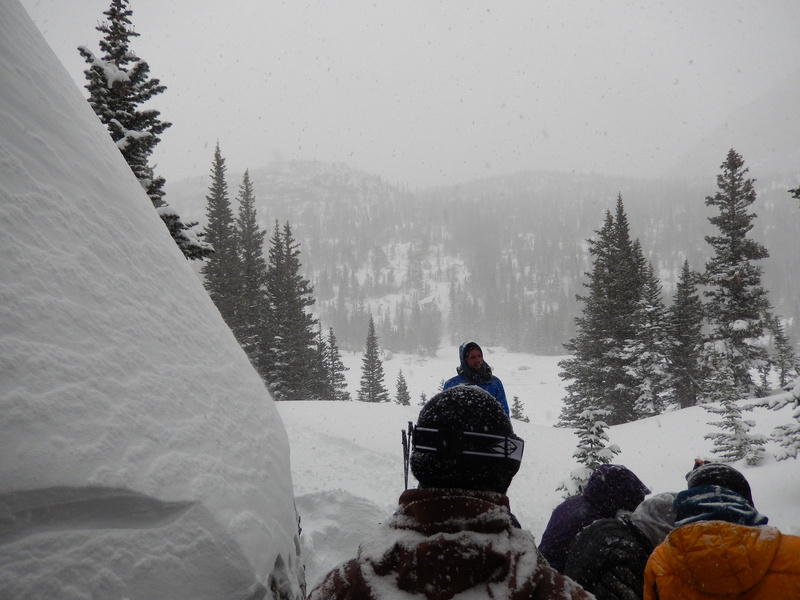 We have been meeting a lot of snowshoers and all of them seem to love it. My wife is hoping we can still do it in the next couple of weeks. But we aren’t in as good as shape as you. Slowly getting stronger and slowly breaking bad habits. Thanks for all the info. I was amazed at how many people were out that day with all that weather! How funny that we likely crossed paths! 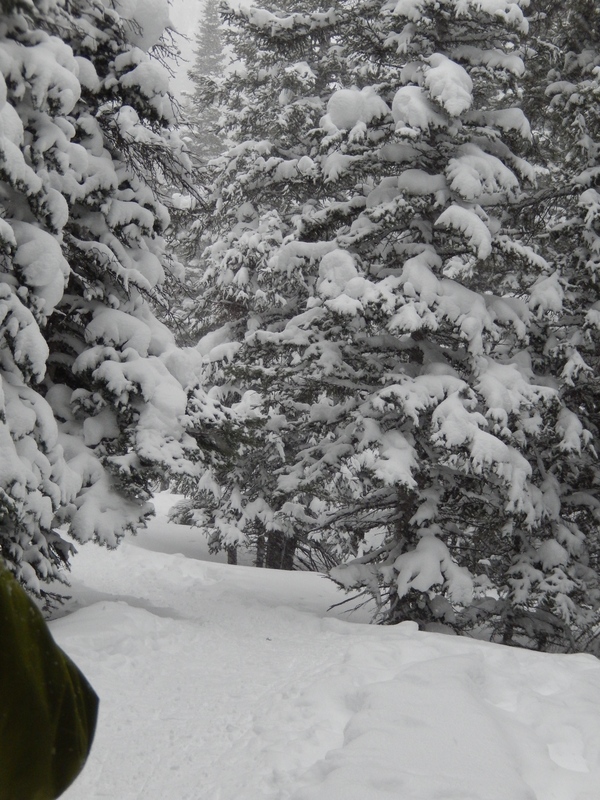 I am totally hooked on snowshoeing! I am going again this weekend and going to try and get a hike in as well. Thanks for checking out the post, I am glad you liked it!! !